Friday night at GOMA Restaurant is the only time for dinner - literally (photo: Mark Sherwood). It may not instantly sweep you off your feet, but when the Story Bridge twinkles and a flurry of jacaranda flowers comes tumbling to the ground, Brisbane certainly gives the illusion of a city de l’amour. Date night in a new city means being forced to up the romantic ante – you’ve got no usual spot where wait-staff already know your order, no take-out and Gogglebox. If you find yourself loved up in Queensland’s capital, there’s ample opportunity to break the routine and spark a little romance. Brisbane Powerhouse: from cabaret to comedy. When date night rolls around, hip young things go hand in hand to the Brisbane Powerhouse. The graffiti-clad former powerstation oozes cool, with an event calendar that runs the gamut from comedy to cabaret. After some belly laughs, a little art appreciation, and perhaps a shared cocktail jug at WATT bar, amble a few hundred metres along the waterfront to the New Farm Park CityCat jetty. More than just a mode for getting from Point A to B, the CityCat is Brisbane’s answer to the Venetian gondola – sans serenade, of course. Hop aboard an outbound CityCat and make your way downriver to Bretts Wharf at Hamilton. From here, it’s an easy stroll to the city’s most atmospheric, alfresco food court: the Eat Street Markets. A shipping container pop-up turned permanent night market, Eat Street bustles every Friday and Saturday evening. Like a Millennial’s fantasy come to life, every Instagram-worthy food is on offer here, from rolled ice-cream to cronut cones, Tim Tam coated apples, Nutella martinis and marshmallow sandwiches. Mix fondue with fairy lights and you’ve got the recipe for sweet, sweet loving. For a failsafe date, arrange to meet your special someone at Brisbane’s chicest address, James Street – bringing the butterflies in your stomach along for the ride. Reliable yet refined Harvey’s – for the new romantic. You really can’t go wrong with a classic dinner-movie combo, especially if it’s a foreign flick or something a little artsy at Palace Centro. Conveniently, Palace Centro is neighboured by some of Brisbane’s favourite food haunts, from the much acclaimed and always boundary-pushing Gerard’s Bistro to reliable and refined Harvey’s, its casual sister venue Tinderbox, and mod speakeasy Sixes and Sevens. Communal date night, James Street Cooking School. If you’re wanting something a touch more hands-on, James Street Cooking School will help gauge whether or not your new flame knows their way around the grill. 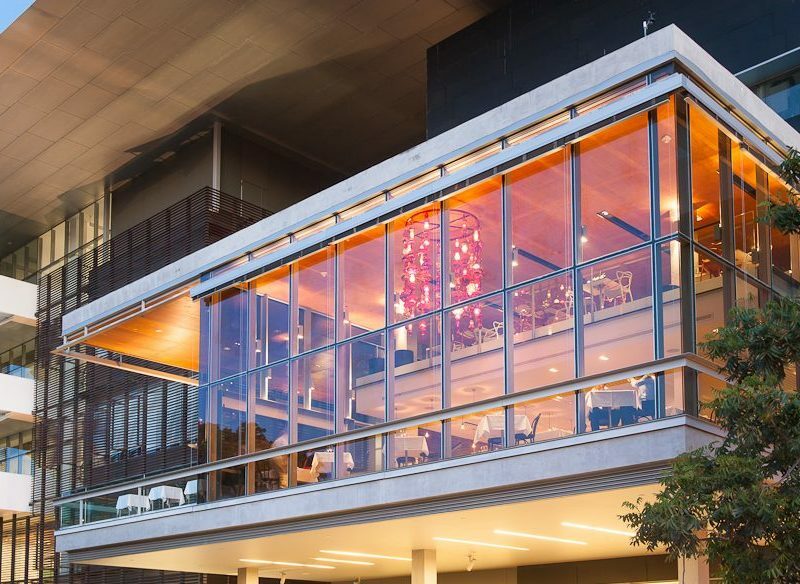 Friday night at GOMA Restaurant is the only time for dinner – literally (photo: Mark Sherwood). Brisbane may be a city known for its laidback lifestyle, but you don’t have to dig too deep to uncover its sophisticated side. By day, the cultural hub of South Bank heaves with sandy-footed tourists at Streets Beach, but by night it’s all about the well-heeled taking in a show at the Queensland Performing Arts Centre, or a special Up Late event at the Gallery of Modern Art. The latter’s namesake dining, two-hatted GOMA Restaurant, is home to one of Australia’s hottest young chefs – Josue Lopez – but dinner here comes with a catch: it’s Friday only. If you do snag a table, the dot-painting-inspired wattleseed custard is a must. A sojourn south of the city isn’t necessary for a date night to remember. The best of Brisbane’s dining is concentrated in and around Eagle Street, with fine-dining icons like Aria and Customs House privy to one of the best panoramas in town: the Story Bridge, shining bright like the diamond in Brisbane’s crown. Speaking of which, the big question has been popped dozens of times atop Story Bridge – with a 100 per cent success rate, so we’re told.